All of our Appliances have been cleaned, tested, and guaranteed to work! 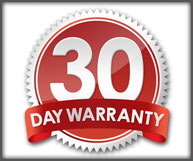 All will come with a full "repair or replace" warranty for up to 30 days depending on the unit. If the appliance develops an issue within that time period, we will fix it at no charge to you!! If the issue is more costly than the value of the appliance, we will replace it with a comparable model at no charge to you!